Origin: Bred by Dr. Griffith J. Buck (United States, 1984). Bloom: Repeat Blooming. 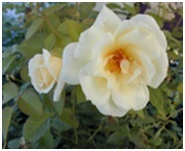 Medium-large, full (26-40 petals), cluster-flowered, in small clusters bloom form. Blooms in flushes throughout the season. Interesting Facts: Very resistant to disease.